The Volkswagen Sharan has been on the UKs roads for some years now and in it’s present guise it offers buyers a worthwhile option when looking for a large seven seater MPV. 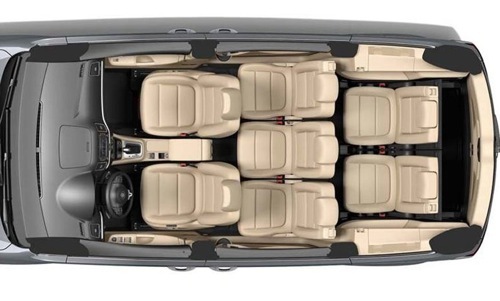 The Sharan has to be one of the most practical seven seater MPVs on the market with it’s excellent seating system. There are three full size individual seats which tilt and slide giving passengers plenty of legroom or making the already cavernous boot space even bigger. You can even get special seats that turn into booster seats. It’s almost like being on a plane but with more legroom as you get picnic tables in the outer seats in the middle row. Pull a leaver on the top of one of the outer seats and it tilts and slides forward out of the way to give easy access to the rear most seats. There is enough room for adults in the boot seats and for kids there is plenty. The seats are so easy to fold down. Just a pull on a loop that sticks out from the base and fold them down. All the seats fold flat so you are left with a massive load area to move the largest of objects. 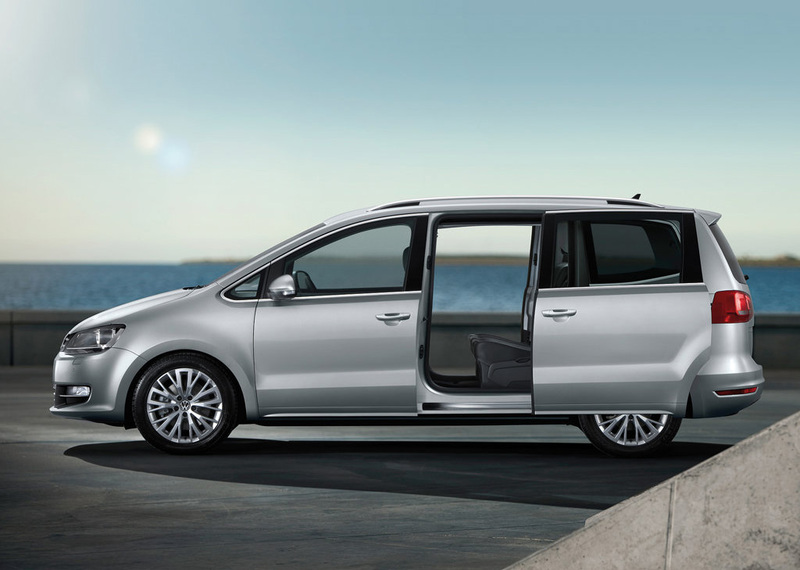 There’s no struggling with car seats in the Volkswagen Sharan as a sliding rear door makes it so easy to get the kids in and out. If you want to make life even easier for yourselves you can add an electric option and they open with the press of a button. All engines available on the Sharan are quiet there is a lot of insulation to ensure that very little road noise gets into the cabin so the experience of travelling in the car is peaceful. Particularly because the suspension, whilst on the firm side seems to just soak up the bumps in the road. Because you have the space in this seven seater you’re passengers have room to spread out, recline and arrive at their destination refreshed from the long journey instead of exhausted from it. 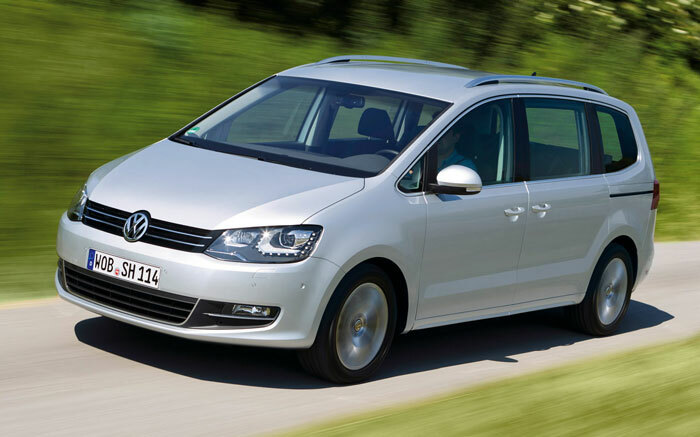 Get behind the wheel of the Sharan and you immediately experience that customary Volkswagen feeling of quality. Even the indicator levers have a satisfying click as you turn them on or off. This is German engineering at its best and everything is logically positioned for the driver providing you with all the information you need. There is a good level of equipment on this car. Dual climate control is standard on all models and if you like a bit of music when you’re on the road you can easily connect your iPod to the cars stereo system or enjoy the DAB digital radio. The Sharan handles exceptionally well. There is a firm suspension setup which means there is very little body roll and you can throw it round corners in a way that belies it’s size. And you certainly won’t forget that this is a large car and it can take some manoeuvring, especially in town. There are two petrol and three diesel engines giving you plenty of choice and all return excellent mpg figures. The two petrol engines are a BlueMotion 1.4 TSI 150PS which has a top speed of 122 mph and a 0-60 time of 10.7 seconds. Fuel consumption is just 39.2 mpg which for such a large car is really phenomenal. An automatic gearbox is available on this engine which strangely give even better performance than the manual and with only marginally worse fuel economy. If you are looking for more power then the other petrol engine is a 2.0 TSI 200PS. This will accelerate the Sharan to 60 in just 8.3 seconds and has a top speed of 137 miles per hour, though fuel economy suffers at just 33.2 mpg combined. Most buyers will opt for one of the diesel engines. All three diesel options are 2 litres using the excellent Volkwagen BlueMotion Technology but with different power outputs. Both the 115PS and the 140PS engines have the same fuel economy and the most powerful 170PS engine only loses a couple of miles per gallon so your decision will probably be based on cost and if you want an automatic gearbox as that is not available on the lowest one. The 2.0 TDI 115PS is the cheapest of the options but will transport the Sharan to 60 mph in 12.6 seconds with a top speed of 114 mph. If you want more performance the 140PS has a top speed of 121 mph and 0-60 time of 10.9 seconds. The top of the range 2.0 TDI 170PS has a top speed of 130 mph and gets to 60 miles per hour in just 9.8 seconds. 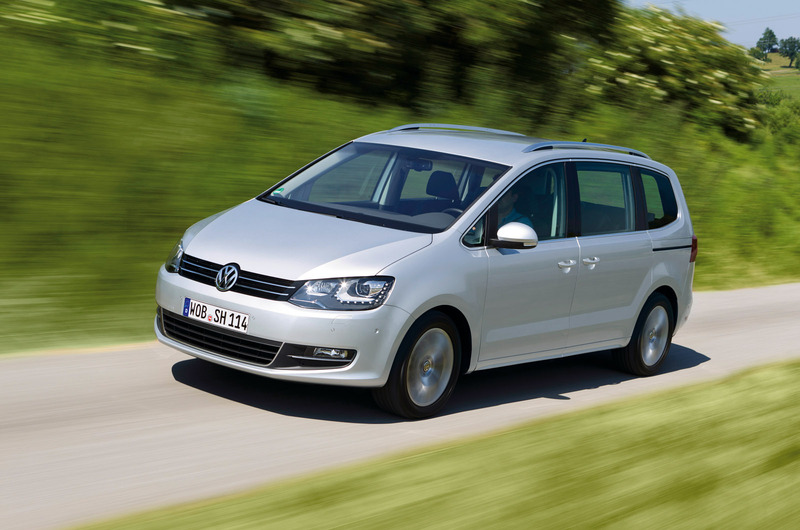 The Volkswagen Sharan scored five stars in the Euro NCAP tests. Full length curtain airbags to even the passengers in the boot are protected in the event of a collision. There are a host of active safety features as standard on every model in the range including stability control and tyre pressure-monitoring system. Volkswagen cars have an excellent reputation for reliability and although it hasn’t been around long enough to find out if the new Sharan keep up that reputation there is no reason to doubt that it will. The build quality is strong and many of the engines and parts have been used on other cars in the Volkswagen line up without problems. The engines on the Sharan are exceptionally fuel efficient and in low VED tax bands so you can expect relatively low running costs for such a large MPV. The BlueMotion diesel engines are the obvious choice if you are looking for decent performance but want to keep down running costs. The Volkswagen Sharan has to be on any buyers shortlist who’s looking for a large seven seater car. It is one of the most spacious MPVs on the market and the seating system is very flexible. Build quality is excellent and the range of engines provide buyers with the performance they need combined with excellent fuel economy. The problem with the Sharan comes when you look at the cost because for less money you can have a Seat Alhambra which is virtually the same car with a different badge on the bonnet.